Her name was a four-letter word; it was fitting. It was the same length as her counterparts: hate, fear, lust. I didn't hate her and I didn't fear her. In fact, I wanted to be her. I wanted her in my life regardless of the sacrifice it would take on my behalf. I needed her in my life regardless of how weak I would become. She was there in the beginning. She is what brought us together. We would have never made it to where we are now without her, so she was good for something. Once I got him, though, she stepped out of the picture. She would come around every now and then, but I made sure she kept a distance. She was graceful. Caring. Thoughtful. Breathtaking. He deserved her. As a living being, he deserved every last bit of her. He deserved for me to surrender and just give up and say, "Take her. I want you to have her." But the more he silently begged and the more I could see the yearning in his eyes for her, I just came on stronger, blaming him for what we had become so that he would feel the suffering I had felt for months. What he did was wrong. What he did was human. What he did to me, it hurt, badly, but it was no grounds for me to keep him from her. For months, I hid. I yelled. I screamed. Spears of bitterness and hatred flew from my tongue as they attacked his flesh and heart. He weakened before my eyes and it made me feel stronger. Redeemed. But the stronger my flesh became, the weaker my heart would feel. The longer I kept her out of this relationship, the farther we grew apart. Soon, the distance between us wore on me like a heavy coat. I could feel the burden on my shoulders; the physical weight of shame and guilt was bearing down on my back. I knew that if I just released her from my grip, it would all go away. But I couldn't. I wasn't ready to back down quite yet. The burden of her was taxing. The months turned over into a year and I would wake feeling the ball and chain I was dragging alongside me each day into the night. I would pull it up into the bed as I slipped under the covers I shared with him and I would hide it at my feet hoping that he didn't have a clue that it was there. It all had become too much. My body knew it. My mind knew it. My heart sure as anything knew it. I woke one day to see the ball and chain had broken. The chain dangled at my ankle while the ball had rolled onto the floor and under the bed. My shoulders had released and the knots in my back and stomach had softened, allowing my muscles to relax and calm. I looked at him and his face was softer. I could tell she had been in the room while I had slept. There was a knock at the door. I fully awoke, stunned. I fought it at first. I told myself I wasn't ready to let him have her yet. I struggled. I wrestled. And then, for the first time in our matrimony, I released her from my knuckles, white with fear. I got up, slowly, and opened the door. On the other side, she was there. She was beautiful, really. He deserved beautiful. He deserved her. Her name was Love. And I let her come in. "I'm sorry," I whispered. To her, to him. "I have a friend," she said. Forgiveness walked through the door. "Please stay," I told her. "I think we need you both." 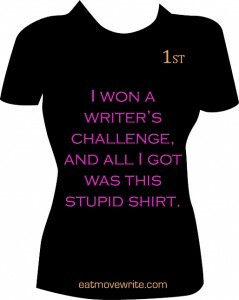 I won May's Short Story writing contest courtesy of Eat, Move, Write. I was proud of this piece of writing and couldn't be more excited. The entirety of this entry is not meant to be read into, but there is still a lot of truth in the words. This deserving of many prizes. I love each and every word. Just beautiful. Your post actually spoke to me more than you will ever know! What a powerful piece. It is something I will certainly be thinking about longer than most things I read. Thanks for sharing. You certainly should be proud of it. Beautiful. There are no other words but beautiful.